There's nothing like returning to your hometown as conquering heroes to play a gig and an ideal perfect place to make a record of the occasion in your first live concert film. And so we have the Black Veil Brides with a Los Angeles homecoming gig shot at the fabulously famous Wiltern Theatre. On tour in 2015 in support of their fourth album, they seem to be slowly making their mark as a more serious outfit with a healthy/loyal, some might even say ravenous, following which does seem to err on the side of mainly younger females so kudos to them for broadening their Metal demographic. If they do nothing else, they ignite a passion in the young ladies who may well be dipping their toes into the Metal pond for the first time. From the pitch of the welcome and ovations the band receive, it's clear that particular group make up the bulk of the audience. 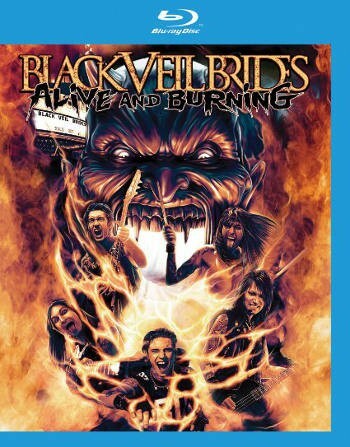 In fact, you could easily see the BVB brand developing into something not too far from the cartoon-like heroes as portrayed on the DVD casing – just imagine the animated series spin off with the BVB's solving mysteries in their own inimitable "larger than life" style, all the while crashing out their latest new song – ah... I digress. At just over an hour of music, it might be a case of short shrift, but the energy expended more than makes up for it. The Brides shed as many calories in half the time it takes other bands – that almost sounds like a marketing slogan or ad campaign. For the duration of the show the band are stood (posed even) triumphantly along the front of stage platform, legs and feet splayed, naturally which is great for the "little 'uns" at the back although anyone who's been to a few BVB gigs will recognise that space is more likely to be occupied by the parents who've had to come along with the little darlings. Andy Biersack is a front-man who it's hard to take your eyes off. Although his partners in crime do their utmost to get noticed, guitarist Jeremy "Jinxx" Ferguson digging out the electric violin as well as working the tongue waggling to the max, he's the one main focal point – from the throat ripping screams (during opener 'Heart Of Fire') to his clearer and frankly more impressive and impassioned "clean" vocals. Ash Purdy forsakes the shirt to show off not only a striking six-pack, but the fact that between the five of them, they must keep the tattoo parlours of LA in business, especially with a set of fans keen to match the look. From beginning right through to the crowd pleasing participation of 'Fallen Angels' and showcase set closer 'In The End', this is nothing less than a must for the loyal Black Veil Brides Army.